The rainbow trout (Oncorhynchus mykiss), is one of the most respected and sought after of Alaska’s native game fishes. Serious anglers from the world over are drawn to Alaska to experience the thrill of challenging this hard fighting salmonid in the state’s wilderness waters. Once you decide on fishing Alaska for big rainbow trout, the Royal Coachman Lodge should be at the top of your list. The clearwater lakes and streams draining into Bristol Bay provide outstanding habitat. Alaska manages rainbow trout fisheries for the health of the species and for a diversity of recreational angling experiences. Wild trout are abundant over most of their range, but daily bag and size limits are intentionally conservative. Artificial lure-only regulations are commonly used to reduce angling mortality. Because of the importance of this valuable resource, Royal Coachman Lodge has a strict policy of catch and release, barbless hook fishing only for rainbow trout. Rainbow trout are found in nearly all the waters we fish. 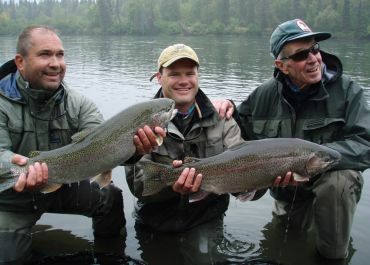 Some terrific rainbow fishing is found right in front of our lodge each spring and fall. Royal Coachman fishes for rainbows in more than 15 rivers, ranging from small wading streams to larger rivers such as the upper Nushagak and Kvichak rivers. Many trophy trout hunters have said “if you want to catch giant brown trout you go to New Zealand’s south island. 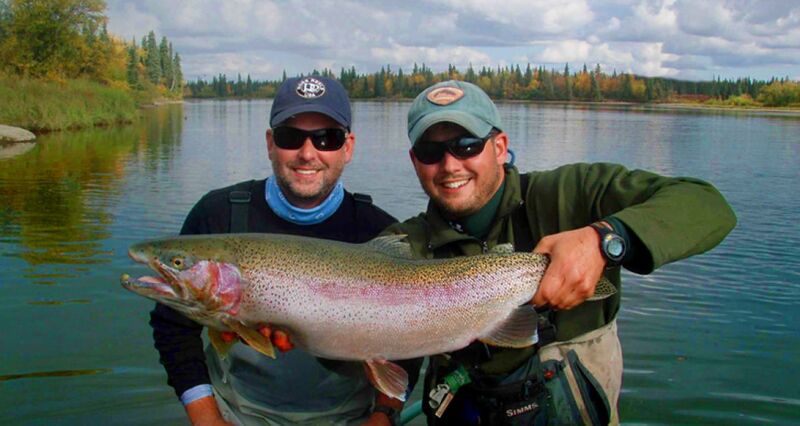 And If you what to catch huge rainbows, you come to the Royal Coachman lodge in Alaska!" 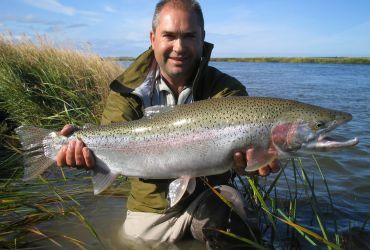 If rainbow fishing is what you love, then you will feel right at home at Bristol Bay’s Royal Coachman Lodge. Our guides seem to become infatuated with these trout as the season progresses. They hone in on the EXACT locations of these trophy trout on all of the rivers and lakes that we fish. At the end of EACH fishing day, these professionals have an evening meeting to share updated information with the rest of the guide staff. This open approach to guiding does not happen at all fishing lodges. And WE pride ourselves on making sure ALL our guest have productive fishing. Alaska Rainbow Trout respond to a variety of fishing techniques. 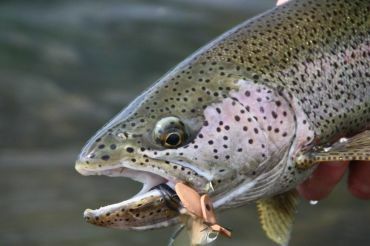 Early in the year rainbows respond well to traditional dry flies and nymphing techniques. As the spawning salmon begin to release their eggs the rainbows feeding locations get more consolidated. Indicator fishing, egg imitation soon become a very productive way to catch fish. But if you like “play around” these giants residents can be caught using alternative methods. Our guides always love to play with mouse imitations and big ugly streamers to temp these fish! Early and late in the season can be great streamer fishing too. There is nothing like a hard streamer strike to get you fired up. Come to our Alaska fishing lodge and see why our clients love it!